At a time when so much attention is focused on alternative facts, You Don’t Know China by John Grant Ross, author of Formosan Odyssey, reminds us that the Trump administration doesn’t have a monopoly on bending the truth – either deliberately, or through carelessness. You Don’t Know China amusingly debunks twenty-two enduring myths about China, ranging from history and economics to language and food. Does Chinese medicine work? Did Marco Polo really go to China? Is the fortune cookie Chinese? What's the truth about Feng Shui? It is occasionally controversial, exploring, for instance, Chinese isolationism, myths about Nixon in China, and cherished beliefs about the Opium Wars. 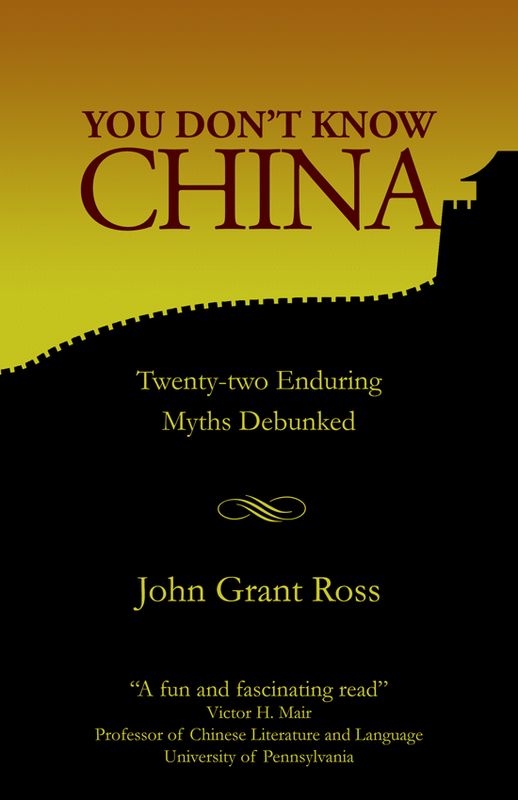 John Grant Ross here offers a glimpse into his book, by explaining the Great Wall is neither a single wall, nor particularly ancient, by taking a wrecking ball to some commonly held ideas about acupuncture, and by asking if it's really true that Mandarin will soon become a world language. There are so-called “facts” that you pick up and repeat, only to find out years later that you’ve been believing and spreading falsehoods. If you’ve ever mentioned China’s “ghost cities,” or remarked on Mandarin becoming an international language to rival English, if you’ve ever told anyone there was a “no dogs or Chinese” sign in old Shanghai, or said that the Great Wall is two thousand years old, then you’ve been spreading myths. You Don’t Know China is a shortcut corrective to numerous commonly held but erroneous beliefs about the country, with twenty-two chapters containing condensed information which might otherwise take years of reading to acquire. Let’s look briefly at a few of the myths, starting with the subject featured on the book’s cover: the Great Wall of China. So numerous are the misconceptions about the Great Wall, sifting fact from fiction becomes almost a study in myth making. For a start, it is not “a wall” but a series of walls that do not link up as a continuous line. People imagine a stone wall stretching across China like the spectacular tourist sections near Beijing, but the vast majority is not like that — there are long sections of gaps, earth mounds a metre or two high, and trenches. Neither is the Great Wall ancient. The impressive sections we can see today were built in the late Ming less than five hundred years ago, and the sections near Beijing which tourists visit are twentieth-century restorations of the Ming wall. The most outlandish and easily debunked Great Wall myth is that it is the only man-made object that can be seen from space (or, even more farcically, from the Moon). There are also other more nuanced and interesting myths related to the Wall which touch upon it as a concrete expression of China’s perpetual isolationism and binary worldview of Chinese and Barbarian. As with the Great Wall, many other facets of China’s history and culture are mistakenly credited with undeserved antiquity, as if Chinese civilization sprang forth as an almost fully formed entity two thousand years ago. Acupuncture is a perfect example. What we now know as Chinese acupuncture is a twentieth century invention. Yes, its roots are old, but it was more akin to bloodletting and was not a medical practice held in high esteem. In 1822 the Imperial Medical Academy removed acupuncture from its syllabus, as it was no longer seen as fit for the court. It remained a treatment for the common people, and was mostly performed by illiterate folk healers. The low point for acupuncture and Chinese medicine came in the 1920s, when radical modernizers tried to ban it. Practitioners were successful in preventing the proposed ban, but acupuncture faced an uncertain future. It was revamped, the needling points moved away from blood vessels and toward nerve pathways. Using Western anatomical knowledge — in particular, that of the nervous system — the map of acupuncture points was adjusted, and ultra-fine needles were used instead of the coarser older ones. Notwithstanding these changes, acupuncture was still headed for irrelevancy until the Communists sought to promote it in the 1950s and 1960s. Turning to modern myths, we see that China’s scale — its physical size and population — matched with the hyperbole over the country’s economic rise, predisposes us to believe falsehoods such as China’s cities being the world’s largest and Mandarin becoming a leading global language. For more than a decade now, Mandarin has supposedly been the hot new language to learn and is said to be fast catching up with English as a world language. The truth is that is has grown quickly in popularity but from such a low level that the absolute numbers of learners outside of China are still very low. And a breakdown of the statistics (which I scrutinize in the book) reveals that the much-touted boom is less impressive than it seems. Firstly, Mandarin classes have a very high dropout rate, so the number of students getting a real mastery of the language is quite low. In addition, a high percentage of Mandarin students are “heritage learners” (people raised in households with that language present, for example, an American-born Chinese whose granddad speaks Mandarin or one of the other Chinese languages at home). Mandarin is unlikely to grow to any great extent because contrary to the hype, mastery of the language is not a golden ticket to lucrative employment in China or anywhere else. When people hear you’re learning the language their approval gushes forth: “Smart move. If you can’t beat them, join them.” These cheerleaders don’t have any actual experience with the job market for Mandarin speakers. They’re assuming — from all the news stories and the made-in-China deluge — that a rising China is a big fat cash cow ready to be milked. Well, the cow is more wind than milk. Details: You Don’t Know China is published inpaperback and eBook by Camphor Press, priced in local currencies. International Women's Day: be bold for change.